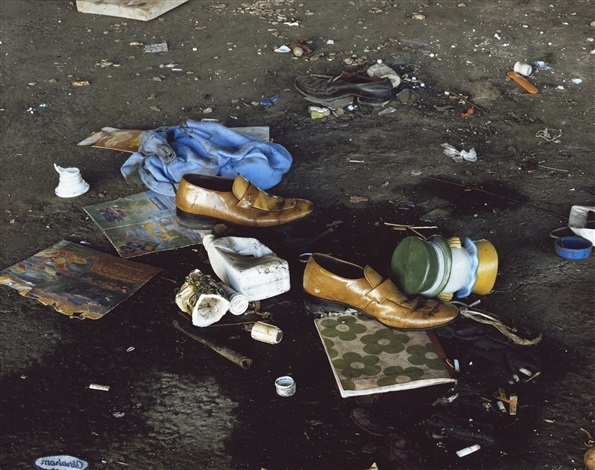 The new image that I searched was Landscape for the Homeless #19 by Anthony Hernandez. This photo was one of the series of photos in Landscape for the Homeless. Anthony Hernandez photographed Los Angeles homeless encampment. I thought it was interesting that the artist highlights how the homeless are often invisible through absence of them. One of the questions that my partner asked was What if this is a painting? I thought that if this photo was changed to a painting, it would lose a lot of its details such as textures of the ground and the objects. Also, I thought making this photo into a painting would make this image more abstract and strengthen the image. In this painting, I tried to abstract the original photo. 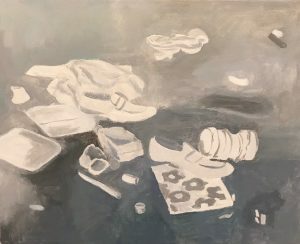 I painted all the objects in the photo in white color and more simple to make the objects more abstract. I removed the textures of the objects and I only used light gray color for darker parts. I obscured the objects so the viewers cannot easily recognize the objects. By giving stronger contrast to the positive and negative space, the objects that have been often neglected in our real life are more highlighted. Through obscuring and highlighting the image at the same time, I tried to bring up the social issues about how we see the marginalized people of our society.